The forests of the coastal regions from California to British Columbia are renowned for their unique and ancient animals and plants, such as coast redwoods, tailed frogs, mountain beavers and the legendary Bigfoot (also known as Sasquatch). Whereas Bigfoot is probably just fiction, a huge, newly discovered spider is very real. Trogloraptor (or "cave robber") is named for its cave home and spectacular, elongate claws. It is a spider so evolutionarily special that it represents not only a new genus and species, but also a new family (Trogloraptoridae). Even for the species-rich insects and arachnids, to discover a new, previously unknown family is an historic moment. A study of the new family and its evolutionary and conservation significance was published in the open access journal Zookeys. 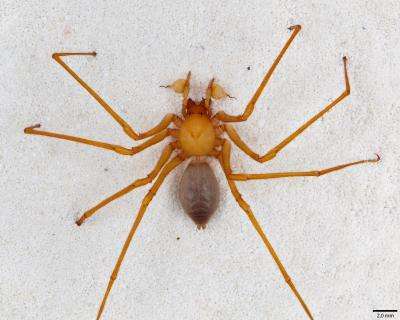 A team of citizen scientists from the Western Cave Conservancy and arachnologists from the California Academy of Sciences found these spiders living in caves in southwest Oregon. Colleagues from San Diego State University found more in old-growth redwood forests. Charles Griswold, Curator of Arachnology, Joel Ledford, postdoctoral researcher, and Tracy Audisio, graduate student, all at the California Academy of Sciences, collected, analyzed, and described the new family. Audisio's participation was supported by the Harriet Exline Frizzell Memorial Fund and by the Summer Systematics Institute at the Academy, which is funded by the National Science Foundation. Trogloraptor hangs beneath rudimentary webs on cave ceilings. 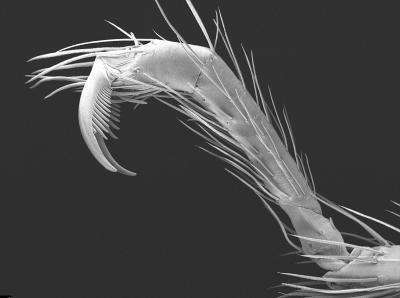 It is about four centimeters wide when its legs are extendedlarger than the size of a half-dollar coin. Their extraordinary, raptorial claws suggest that they are fierce, specialized predators, but their prey and attack behavior remain unknown. The anatomy of Trogloraptor forces arachnologists to revise their understanding of spider evolution. Strong evidence suggests that Trogloraptor is a close relative of goblin spiders, but Trogloraptor possesses a mosaic of ancient, widespread features and evolutionary novelties. The true distribution of Trogloraptor remains unknown: that such a relatively large, peculiar animal could elude discovery until 2012 suggests that more may be lurking in the forests and caves of western North America. They aren't delicious, they are crunchy and gooey, and a little bitter. They aren't that big? There are way bigger spiders. Yes, I was laughing at the coin reference, you are more likely to run into one of these spiders then you are a "half-dollar coin". "larger than the size of a half-dollar coin"
I've lived in the USA for twenty years and have never seen a half-dollar coin. Can you please use some comparison that makes sense? between a quarter dollar and a dollar. not very big for a spider. I'm thrilled that Oregon is home to such a spectacular creature! And yeah- we have black widows here (in Oregon) that are bigger than a 50 cent piece (which is 1.2" dia, BTW), and of course, tarantulas are often way bigger than that. How would you like to have one of those decide that you are the "specialized prey" while walking in a dark cave? Geeezz! I'm assuming the "Bigfoot" reference is due to it not being discovered until now, and not to its size? Just don't tell Bear Grylls about this. Coin version of Bigfoot emerges from article about spiders in the Pacific Northwest - apparently they discovered a long-thought extinct species of money: the half-dollar coin. I've seen Bigfoot. In fact, I was married to her for 8 years. half dollars/50 cent pieces are bigger than dollar coins. at least all of them ive seen.